Hungry yet? These turned out great. It's probably the second recipe I used when I started making bread in the first bread machine. The recipe works in a Bread Machine or if you want to do it with a dough hook, I've done that too. I baked the dough in the oven for 8 minutes at 450. Why some look darker than the others... your guess is as good as mine, they were all baked at the same time at the same temperature. Spooky! 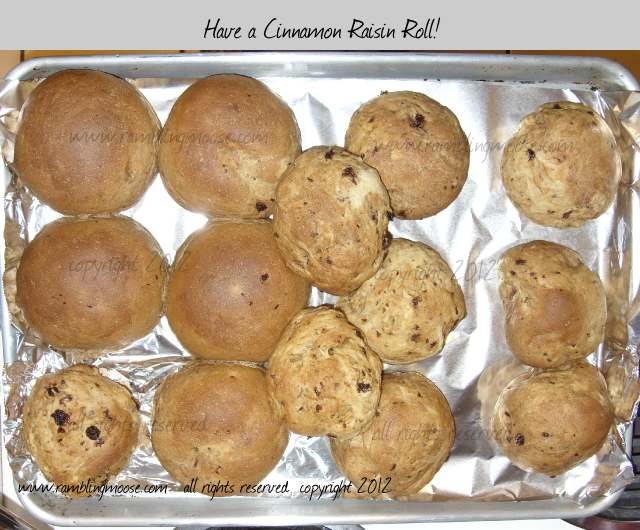 But the rolls turned out great, and they're wonderful with Peanut Butter and Jelly or toasted with Butter. Here you go... first the ingredients for a 2 1/2 pound batch directly from the book. * Cinnamon it says add at the beep. That machine allowed you to add ingredients after the first rise. When I made this bread, I allowed it to mix for 15 minutes, then add the cinnamon. I then restarted the machine on dough cycle and allowed it to run for 30 minutes. I also let it rise for 4 hours. Also cooking with Cinnamon in the dough with yeast is supposed to cause the yeast to work less effectively. I actually doubled the yeast for just that reason and got great results. * Add the Walnuts at the same time as the Cinnamon. I have used Pecans because they're easier for me to find plus they have a much stronger flavor. It's your choice! I use High Gluten flour for the "Bread Flour". You'll get much better results that way.